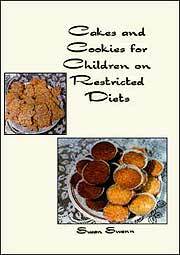 This recipe comes from Susan Swann who has written the book Cakes and Cookies for Children on Restricted Diets which came about because of her youngest daughter's multiple food allergies and food intolerance. The book is full of recipes which are dairy free, gluten free, wheat free, corn free, egg free, sugar free, reduced sugar, yeast free or soya free. For example, this particular recipe is dairy free, gluten free, wheat free, corn free, egg free and yeast free. This recipe is dairy free, wheat free and gluten free . Line and grease an 8 inch (20 cm) round cake tin or a 7 inch (18 cm) square tin. Tie a band of brown paper round the outside of the tin for extra protection. You need to start the cake the night before you want to bake the cake. Weigh out the dried fruit and mixed peel, place it in a mixing bowl and mix in the brandy make sure it is well mixed in. Cover the bowl with a clean tea-cloth and leave over night to absorb the brandy for 12 hours. Next day pre-heat the oven to gas mark 1, 275°F (140°C). Begin the cake by sifting all the flours, salt and spices into a large mixing bowl lifting the sieve up high over the bowl to give the flour a good airing. Next in a separate large mixing bowl, whisk the dairy free butter / margarine and sugar until it's light, pale a fluffy. Now beat the eggs in a separate bowl and then add them to the creamed mixture a tablespoon at a time. The mixture may curdle but don't worry. When all the eggs have been added, fold in the flour and spices, using gentle folding movements and not beating at all. This helps keep all the air in. Now fold in the fruit, peel (if using), chopped nuts and treacle and finally the grated lemon and orange zests (if using). Next using a large spoon put the cake mixture into the prepared tin and spread out evenly using the back of the spoon. Cover the top of the cake with a double thickness of greaseproof paper with a hole about the size of a 50 pence piece in the centre. This helps give extra protection during the long slow cooking). Bake the cake on the lowest shelf of the oven for 4 1/2 - 4 3/4 hours. Sometimes it can take up to 1/2 - 3/4 hour longer but don't be tempted to look before at least 4 hours have passed. To test if the cake is cooked, insert a cake tester or skewer into the cake. If it comes out clean then your cake is cooked if not it needs cooking for a little longer. Test in several places to make sure it is cooked all over. When your cake is cooked cool the cake for 30 minutes in the tin, then remove it from the tin onto a wire cooling rack to finish cooling. When it is cold 'feed' the cake. Make small holes in the top and bottom of the cake with a thin needle or cake tester, then spoon over teaspoonfuls of brandy to soak into the cake through the holes. Now wrap the cake in a double layer of greaseproof paper, then either wrap it in two layers of tin foil or keep in an airtight tin. 'Feed' the cake (as described above) at odd intervals I 'feed' mine once a fortnight leading up to Christmas but you can 'feed' it weekly if you wish. I usually make my Christmas cake the last week of October and 'feed it once a fortnight and then decorate it on Christmas Eve. You can decorate it before then if you wish. Decorate your cake with white almond paste (marzipan) and either dairy free fondant icing or royal icing.